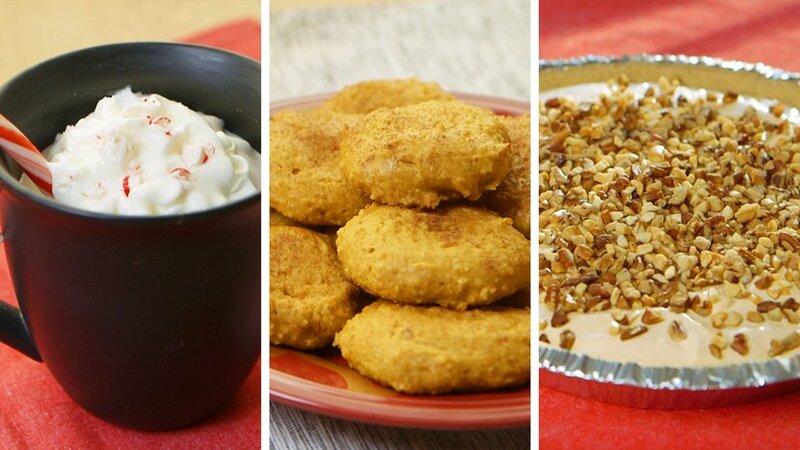 5 Quick and Delicious Holiday Protein Recipes! Make protein the star of your holidays with these twists on classic treats, from protein pumpkin pie to protein snickerdoodles! Quick videos make every recipe a breeze! Not all holiday meals require you to spend hours slaving over a hot stove. These simple, protein-rich recipes—ranging from lattes to oh-so-yummy pies—all bring something special to the table. Whether you choose to integrate them into your seasonal breakfast or serve as dessert, they’re sure to meet your macros and please your taste buds without requiring a lot of prep! When you want to channel the flavors of the holiday season, don’t forget about pumpkin! This protein-rich take on the classic pie adds Greek yogurt to the mix for an extra dose of muscle-building fuel. The addition of crunchy chopped nuts adds some texture to the creamy filling, while two scoops of pumpkin whey make this pie a real powerhouse. Add to that a crumbly graham-cracker crust, and you’re guaranteed to please your muscles and your mouth! Instead of delving into a store-bought batch of this cinnamon-sugar classic, put a muscle-building holiday twist on your own version! These snickerdoodle cookies combine the rich flavors that you’ve grown to love with a little extra pumpkin goodness. The nuttiness of almond flour combined with the sweet puree and seasonal warmth of cinnamon, nutmeg, and vanilla extract will draw you in, while the protein powder and egg white combo fuels your gains. This is no traditional stack of flap jacks. These pumpkin-spice-infused pancakes are a delicious addition to any breakfast and really capture the joy of the season. With a bright, vibrant color, these light, flavorful cakes make canned pumpkin a welcomed addition to any meal. Top with a bit of low-calorie or no-calorie syrup, and you’ll be packing in a guilt-free 4 grams of protein per serving! When the wind chills and the temperatures dip, there’s nothing like a hot, protein-filled drink to warm you back up. This latte offers a healthy alternative to Christmas coffee-house favorites. The combination of coffee and whey makes a for a creamy, frothy base, while the peppermint extract acts as the sweet, minty bow that ties it all together! Make pumpkin spice anything but basic with this recipe that adds a hearty dose of protein to the original blend! Top with fat-free whipped cream for that extra bit of holiday decadence.